Our goal is to foster development through Entrepreneurship. We are a group of highly motivated individuals from around the world of various professions who came together with local Haitian entrepreneurs and dedicated partners in order to mount the first Entrepreneurship Camp in Haiti 2014. Exchange knowledge and build relationships with entrepreneurs to empower them to develop prosperous independent communities and turn around struggling economies. Exchange knowledge: We believe that by learning from each other, we can realize the biggest impact. Our Workshops are conducted on an eye-to-eye level and we are aware that not all of the tools used in our home markets are applicable in other cultures and countries. Build relationships: Help is not a one-time activity; we want to establish continuities and sustainable support for our entrepreneurs on their way to success. Furthermore, we see it as an exchange with our camp as it shows us how much our participants also have to give to our speakers and to us as organizers, hence, we strive to develop relationships as equals. Struggling economies: We fundamentally believe in the potential of entrepreneurship to drive positive social change in developed as well as developing economies. Many economies live through boom and bust cycles but we see our biggest ability to leverage help in economies that are intrinsically struggling and not only experiencing cyclical downturns. Empower: Our goal is to invest in future leaders who have a proactive approach towards taking responsibility for their lives, understanding the risks necessary to achieve significant advances, aiming to achieve independence from external help, and becoming sources of change and inspiration for their local communities. Develop prosperous independent communities: We don’t look at individuals in isolation but instead want to have a positive impact on larger societies. Economic growth is our preferred tool to ensure that these societies can develop into strong, self-reliant communities. Jan Holz, Co-Founder of the Haiti-Entrepreneurship Camp in 2014, was the one who started putting everything into action soon after meeting Jude and sharing his vision for an entrepreneurship camp in Haiti. Professionally, he works as an IT Project Manager at Lufthansa. Jude V. P. TRANQUILLE is the visionary and co-founder of the Haiti Entrepreneurship Camp together with Jan. He studied Computer System Management. And now he’s studying Business Administration at University of People. Jude is also the founder of Devoted Servants – a non-profit organization that supports unprivileged children in the poorest areas in Haiti. Susanne Gellert is part of the core team of the Haiti Entrepreneurship Camp. She is the Director of the Legal Department & Business Development Consulting at the German American Chamber of Commerce in New York and founding president of the Rotary Club of Wall Street, NY. In her position as a Rotary International Representative to the UN, she is also in charge of our film event this November. Overall as an essential member of the core team Susanne ensures a successful camp this year. She is also one of our project ambassadors. Jonas Eichhorst, an entrepreneur himself, was inspired by our idea from the first minute on. Applying his own experience of founding and managing a company he quickly became an important member of our team. He is responsible for the curriculum and participant selection and also strongly involved in important strategic decisions. Lesly Jean-Louis is responsible for logistics, including staff transportation coordination and catering. Tobias Fried is the man for the photos and video. 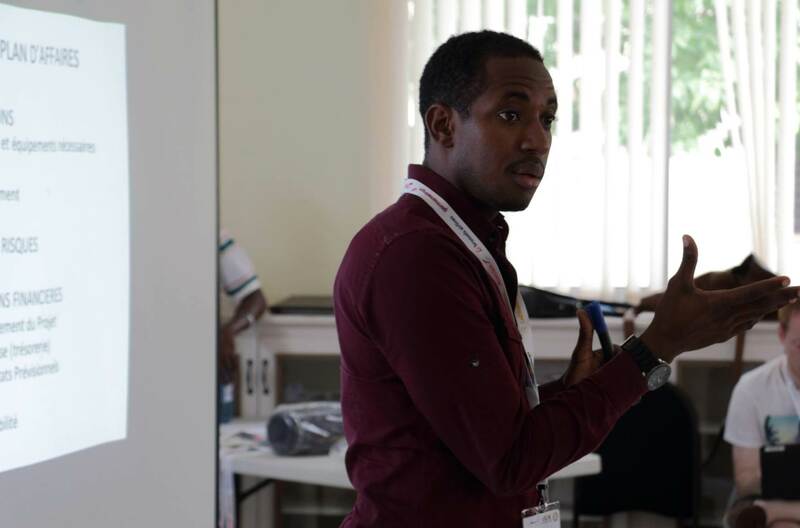 The location spotter, who works for the film and photo industry in the United States, developed the fundraising video for the Haiti Entrepreneurship Camp 2014. Journalist and radio host, Fresly has become noticed by his leadership in various organizations and youth movements. He is the co-founder of a socio-cultural movement called MOJEAC, which he chaired for two consecutive terms. He now serves as the executive director of a non-profit organization dedicated to bettering the lives of underprivileged children in the poorest region in Hait called Devoted Servantsi; and also the chief communication officer in Haiti for the Haiti Entrepreneurship Camp program. Alexandra Heinrich is a core team member and responsible for finance and general management. In Haiti, she was in charge of making sure the Entrepreneurship Camps could run as smoothly as possible. She works as change and project manager for Lufthansa Technik in Hamburg. Felix is working in international sales at thyssenkrupp. Prior to that, he worked for a Danish chemical company. He founded his first company (retail business) when he was 18. Felix studied Business Administration in Germany and the US. Given his first hand experience he tought economics at Haiti Entrepreneurship Camp 2014 and is the project ambassador for Germany since then. Mike Veny is America’s leading mental health speaker and a high energy corporate drumming event facilitator. He delivers educational, engaging, and entertaining presentations to meetings and conferences throughout the world. Mike gives you a fresh new perspective on transforming the stigma surrounding mental health. Mike is the Marketing and Communication director, and speaks on Marketing in our entrepreneurship camp. Louis-Gary Cyprien holds a degree in journalism and communications. He is working as editor in chief of the economic section at Haiti’s largest News Company- Le Nouvelliste Gary is very passionate about making social change. He volunteers as an editor in our entrepreneurship. Lea Gleixner is in charge of Online Communications. Having participated at a Model UN conference in Geneva concerning Haiti immediately called her attention to the Entrepreneurship Camp 2014. Her background in language and business studies as well as development politics completely won her over to join our team. Learn more about the Entrepreneurship Camp here.